Choosing your wedding photographer is a big and sometimes daunting decision so we’ve put together some questions you might want to ask before taking the leap, and if there’s anything else you’re curious about, please feel free to get in touch. We’re always up for a chat. Why is wedding photography, and choosing your photographers, so important? Its not important to everyone but if it is, you should ask yourself why? Are you investing in a photographer because its what everyone else does, or are you passionate about capturing memories in a way that’s true to you and the person you love. If, like us, you believe that photos are powerful enough to capture a piece of you and your history, then choose a wedding photographer who can do that for you. Don’t just consider the photos themselves, but also the people taking them. They will be alongside you every step of the way, capturing some of the most intimate moments of your life, on one of the most cherished days of your life, so pick people you like, people that make you feel confident and happy. After all its not just the photo album but your own memory of the day that tells a story. Choose photographers that will treat those memories with utmost care. What is “documentary” photography and does it include a couple shoot? In a nutshell documentary photography is fly-on-the wall photography that captures raw, honest moments as they happen. Good documentary images require a certain degree of familiarity and intimacy so in our pre-wedding meet up, please don’t be shy. Show us who you guys are as individuals and as a couple and don’t hold back. We will take what we learn and use it to make images that capture your unique connection. While we love candid documentary photography, we are equally passionate about portraiture. So yes, you will absolutely get a couple shoot, should you want one (not everyone does, and that’s also okay). We focus on portraiture (the “posed” stuff) twice in the day – bride and groom portraits taken separately before the ceremony and again during your couple shoot, preferably in the hour before sunset when the light is soft and golden. Even the most natural portraits require some direction – where to stand, how to angle your face to get the best light, and sometimes how to relax. Some couples need a lot of direction (it can be scary standing in front of a camera for the first time) and others are quite comfortable simply engaging with each other and letting us shoot. We will provide as much or as little direction as you need and if you ever feel uncomfortable, just shout and we’ll do something different. 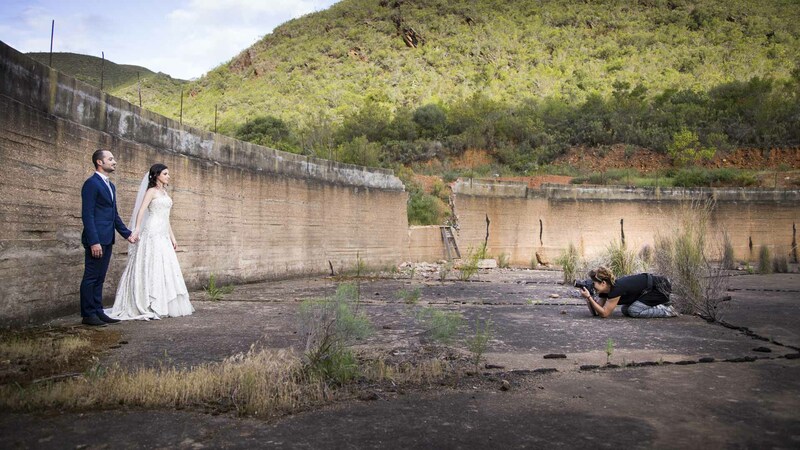 We choose shooting locations away from your guests so you don’t have to feel shy. Just relax and have fun; after all its one of the few times during the day that you get to spend one-on-one time together. We understand the importance of family shots at a wedding since its one of those rare occasions that everyone comes together under the same roof. Having said that, it can be a very stressful process for the couple if made too complicated. We recommend scheduling family photos for just after the post-ceremony hugs and kisses, before everyone has a chance to wander off, and don’t make the list of images too long. We strongly discourage anything more than 10 combinations e.g. bride’s family, groom’s family, bride & groom’s family etc. The moment you step into female cousins, male cousins and so on, you’re in for a long and uncomfortable ride that eats into your couple shoot and general fun time. Yes! We work as a team, lending our own perspective and eye to your wedding day, while creating a final album that is creatively cohesive. Will you photograph every guest at my wedding? While we strive to capture as many of your loved ones as possible, we value moments over box ticking. We don’t do table shots but if there is anyone who you want a photo with, please feel free to grab one of us for an on-the-spot portrait. We’re never far away! Our packages range from 7 to 10 hours, and you’re always welcome to contact us for customised multi-day packages. How many photos do we get and how long do we have to wait? Our packages range from 350 to 600 professionally edited images, delivered on a USB stick in both print and web friendly resolutions. We will email you and post to social media a handful of sneak peaks in the days following your wedding and your full edit will be complete 6 – 8 weeks later. Editing is an integral part of modern digital photography, and its part of the creative process that we really enjoy. We put a lot of time into ensuring that your edit has a coherent look and feel, staying true to our love of honest documentary photography while creating a body of images that is aesthetically pleasing and well thought out. We do remove anything temporary (those cursed stress spots for example) but we do not stretch, eliminate or skinny-fy that which is naturally yours. Imperfections are beautiful, and we would hate your wedding edit to look like an overworked magazine editorial. We shoot with Canon full frame bodies and a variety of prime and zoom lenses, our favourites being the 24 – 70mm, 35mm and 85mm primes. We like sticking close to those we photograph so don’t rely too heavily on zoom lenses, except during the ceremony when its important not to intrude. Of course we have to answer this question according to light. The best light, “golden hours” as we like to call them, is in the very early morning and the late afternoon to early evening. Although we have shot a sunrise wedding (and loved it), most couples opt to have their ceremony in the afternoon. The best time for the couple shoot is an hour before sunset, so if photography is important to you, take this into account and work backwards to decide what time your ceremony should start. Do we need to cater for you? Yes please, and veggie dishes only please. We’re with you the entire day and although we’re always busy, we do need fifteen minutes to eat dinner. While we don’t need a place in your seating plan, please ensure there is somewhere for us to sit, and its best if we eat at the same time as the main table so that we can get food out of the way and continue capturing the magic. Do you charge a travel fee and do you need a place to sleep? We charge the AA rate for any venue more than 100km out of the major cities and since we’re Cape Town based, flight costs where necessary. If your venue is more than 100km out of the city, please arrange shared accommodation for us. We finish late and after a hard day’s work, a long drive home could be dangerous. Yes! We’re travellers at heart with continually itchy feet so needless to say we love destination weddings. Our rate remains the same as at home (no additional charge for travel days), but you will have to cover flight fees and two nights accommodation. Using any spare time before and after the wedding, we’ll also capture special aspects of your chosen destination through travel, street and landscape photography. What can we do to ensure we get the best possible wedding photos? Choose a room with lots of natural light to get ready – good light makes for great photographs. Ladies, please ensure that makeup and hair are finished 30 minutes before the ceremony starts so that we have enough time to shoot beautiful bride and bridesmaid’s portraits. Guys, please don’t suit up before one of us gets to you, as its best to shoot the actual process of you getting ready. Staged shots of you putting on cufflinks can end up looking a little, well, staged. Send us a list of the family photos you want (try keep it to ten or less), and ask your MC or someone who is familiar with both families to help organise everyone into their different groups. The more streamlined this process, the less time it will take, and the happier you will be. Urge your guests to keep their cellphones and iPads tucked away during the ceremony. Glowing screens don’t photograph well, and if your loved ones are too busy snapping, they won’t really be present. Wedding party, try to avoid stripes. It might sound pedantic but striped shirts create unattractive interference with digitally shot images that detract from the subject and emotion of the photograph. It might be tough to let go of the reigns, but if you can manage it, please trust us to shoot your wedding using our own creative intuition and experience. Micro-managing your photographers can be incredibly stifling and won’t lead to your best photos. Schedule your couple shoot for sunset going into early evening, when the light is soft and beautiful. Relax, have fun and most importantly, be yourself!